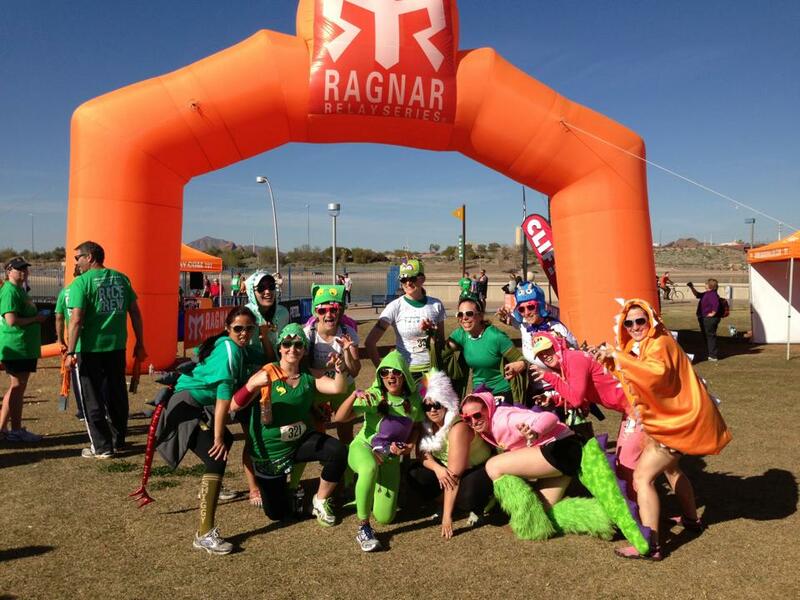 This past weekend I was fortunate enough to run the Ragnar Relay with 11 lovely Dinosaurs. 202 miles of pure ridiculousness in 35 hours. This past December a friend of mine reached out to me to fill a spot in her team, and I’m so glad I nabbed it. I only knew one member of the team, but I didn’t let that stop me from joining in on the fun. It all began Thursday when I flew into the airport to be greeted by the brontosaurus. We rushed around to get provisions for the vans before getting to the hotel at 11pm. Van 1 finally got to sleep a bit after midnight. And then we woke up at 2:30am to make it to the start line. Yeah, nothing like starting a race on less than three hours of sleep! It was frigid out and we were all jumping around for energy at the start line. Our terrordactyl was out on leg one by 5am and we were off to cheer her on. The course was filled with runners and we did our best to scream encouragement to them all. 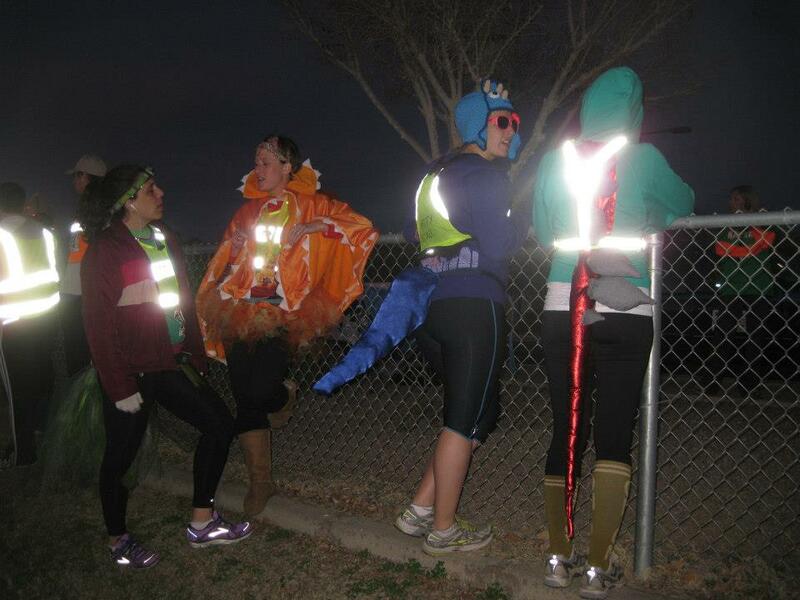 After she came in, we sent off a few more gals to enjoy the dark running environment. By the time my first leg started the sun had finally come up, thank goodness, and I was able to run without any issues. I must admit that I was incredibly nervous about the pace I’d be able to hold for the entire race. I initially put myself in for a goal pace, but when race day came I didn’t think I could sustain. Well, I went out for my 6.7 miler and tried to remain steady. After getting passed by an older woman in the first half mile, I decided to latch on to her and maintain her pace. By the last half mile I was able to pass her and saw that my pace was 30 seconds faster per mile than I had expected. Absolutely best feeling in the world. When we all completed our first legs we decided it was best to have some lunch. And what better place than Cracker Barrel? Dear goodness we stuffed ourselves. Heading back to the exchange point, we took a quick van nap before waiting for our last runner to get in. By the time she arrived we were back in the dark for our second legs. Sadly our first runner never had the chance to run in the sun, fortunately she was an east coaster who was used to the weather. And then it was my turn. By 1opm, when I went off for my second leg, I was exhausted from the running, lack of sleep, and obnoxious cheering. The leg was tougher, but again I found someone going my perfect pace and was able to use them for support. For the second time of the race I surpassed my pace goal and surprised myself (but who can complain about that?!). By midnight we were huddling in a community center, hoping for a few more hours of shut-eye. I can’t say that I was able to sleep, but it was nice to be still for a while. Yet, before any of us had expected, we were roused and had to get on the road again. Around 5am our third legs began and we were on our way to the finish line. Bleary eyed and delirious, we each set out on our final leg. Ragnar reminded me how much I absolutely love running and it taught me a lot about myself. I now realize that I can push even harder than I had expected. If I can maintain a quicker pace when I’ve gotten barely any sleep and have to conquer hills, then there is no reason I can’t push myself day to day. I also realized that being cheered on by five random individuals can do amazing things for your self esteem. I’ve fallen in love with all of my teammates and hope to run with them again in the near future. Ragnar, you’ve got a new fan! And if completing Ragnar wasn’t enough, we decided to do Tough Mudder the following day. Woke up this morning with a fun new set of bruises all over my body. Twas amazing, yet I don’t know if I’ll be doing that again… But that is a story for another time. What is the most insane race you’ve done? Have you ever tried a relay race? So it is Friday, but I’ve finally found a few minutes to complete this great survey from Kenlie (over at All the Weigh). Take a minute to check out my answers then consider your own. What awesome things do you hope to accomplish in 2013? 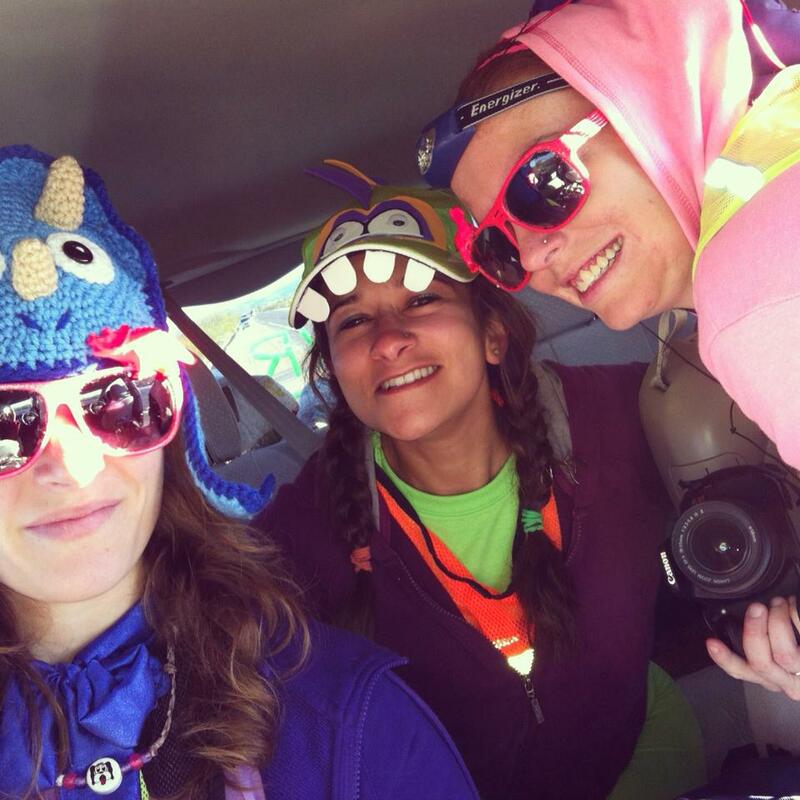 – Soon to be running the Ragnar Relay dressed as Triceratops! There are a few dozen other places on this list. I think I caught the travel bug recently. – Oh dear goodness, this question is more difficult than I thought. The Rock? Some of those questions were a lot more difficult than I’d like to admit. I’m sure I’ll realize something I missed in ten minutes or so… Hope you are all having a great Friday! Remember to check out Kenlie’s FMM post and all those that linked up. 1) We continue successful behaviors and this makes it difficult for us to change. There is nothing wrong with enjoying being successful, but sometimes we need to move beyond our comfort zones. Found this photo today and it is my motivation for the week. 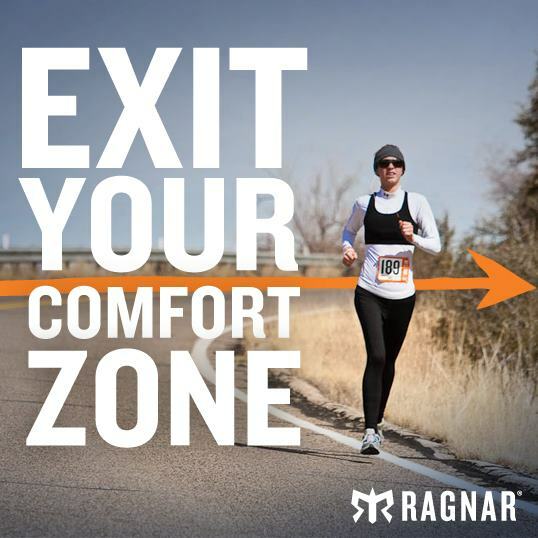 Can’t wait to rock Ragnar in three weeks! 2) One way to spice up your behavior is to take on challenges that you’ll be bad at for a while rather than returning to pursuits you’re good at. Be proud of the things you are great at, but don’t let them stop you from try out something new. Who knows, you may find a new skill or activity that you rock at. Or you won’t rock. There is nothing wrong with that. 3) If you don’t feel at ease in your environment, change it! Find something you are comfortable with as it will entice you to return. Maybe the gym isn’t for you, but have you tried a kickboxing studio? Don’t be afraid to explore, this will just lead to awesome adventures. Worst case scenario – you have a hilarious story to tell your friends. 5) Have a relationship with people who believe in you and whom you believe in. Do not put up with people who do not believe in you. You are awesome, you deserve nothing but respect and love from those in your life. Find people who make you feel good and avoid those who hurt or frustrate you. Life is too short to have toxic people in your life. 6) Learning and change aren’t one-size-fits-all phenomena. It is tough to read or hear someone else’s story and wish that it would happen to you, but that isn’t how life works. This is something I struggle with constantly, I have to remind myself that everyone finds change and motivation in different places. This doesn’t mean it won’t come, just that it may take a different form. What have you done to make positive changes in your life? What pieces of advice do you have?